In his book, Who Owns the Future, Jaron Lanier discusses the idea of real-time income and wealth generation. He presents the topics through the lens of sharing songs in the music industry, but the principle applies to today’s sharing economy. Copying a musician’s music ruins economic dignity. It doesn’t necessarily deny the musician any form of income, but it does mean that the musician is restricted to a real-time economics life. That means one gets paid to perform, perhaps, but not paid for music one has recorded in the past. It is one thing to sing for your supper occasionally, but to have to do so for every meal forces you into a peasant’s dilemma. The peasant’s dilemma is that there’s no buffer. A musician who is sick or old, or who has a sick kid, cannot perform and cannot earn. A few musicians, a very tiny number indeed, will do well, but even the most successful real-time-only careers can fall apart suddenly because of a spate of bad luck. Real life cannot avoid those spates, so eventually almost everyone living a real-time economic life falls on hard times. The hope is that creators can make a living from what they create and do so in a way that allows value from previous creations to drive development of the next. Without insurance, musicians may have to record new albums while on a concert tour instead of taking time away from concerts to create new songs. Yet the issues of real-time income are not scoped to the music industry, as they have found their way into many social media driven businesses. Twitch is a video game streaming platform that runs on virtual subscriptions, much like Netflix. However, instead of subscribing to Netflix to unlock all content on the service, Twitch subscriptions are to individual creator’s channels (like Ninja’s). Imagine paying $5 a month to watch Stranger Things and another $5 a month to watch Orange Is the New Black (plus additional $5 for every other show you want to watch). Would you pay for such a subscription? Sure you could subscribe for a weekend to binge watch an entire new season, but what is your incentive to stay subscribed to Stranger Things while the next season is in development? The show is “off the air” for over a year and you only get to watch re-runs in return for your subscription. Aggregate movie and music subscription services like Netflix and Spotify garner a recurring subscription fee because there is consistently new content, even if it’s not always from your favorite show or artist. You can watch the entire back catalog of hundreds of other shows, while you wait for the next Netflix original to season to be released. The economics work a little differently for singular channel subscriptions on Twitch, but the underlying struggle to maintain attention remains the same. There is no monthly subscription to Twitch.tv. Access to all Twitch content is free and ad supported, and viewers can subscribe to multiple streamers’ channels, each with a $5 subscription (or more depending on tier). Because all the content comes from a single source, creators must supply a near constant stream of gameplay to maintain relevancy and keep subscriber count high. Right now, Tyler Blevins (aka Ninja) is the most popular source of gameplay on Twitch and the biggest name in video gaming. He rose to super-stardom in less than a year with the popularity of Fortnite, but his way to the top was not immediate. He’s been at it non-stop for eight years, yet even after such a level of investment, his future success still hinges on him showing up to stream games every day. By default, Twitch creates a business model that plants its creators squarely in a real-time economics life. Ninja and the most popular streamers have some level of recurring revenue through a back catalog of highlights uploaded to YouTube, but staying current is of utmost importance. Attention is fickle and people will quickly find ways to spend their time elsewhere. Over the course of a weekend, Ninja lost thousands of subscribers (equating to nearly a quarter million dollars in lost revenue for the month). Yet, his hard work is paying off as Ninja is currently bringing in close to $1 million a month from Twitch subscriptions, donations, YouTube revenue, and sponsorships (up from ~$80,000 in 2011), but others in the long tail of Twitch success are not in such a fortunate position. Streamers and YouTubers are working just as hard, just as often as Ninja and still not at the level of 2011 Ninja. And all Twitch stars are worrying about what comes next. Ninja isn’t the only one making waves for tremendous individual online success. Compare the story of the biggest new entrant in the world of sports and with the work of fashion mogul and world’s youngest billionaire: Kylie Jenner. Both have tremendous followings and leverage their social media influence to build greater notoriety. The difference is in the kind of work they do. Kylie Jenner is different than other pure social media stars who rely almost solely on ads and sponsorships, whereas her main source of income comes from her business that sells products (not just brand merchandise). She pieced together various technology services to generate supply, ship orders, and orchestrate the operation from her social media accounts. Instagram and Snapchat are tools in her business strategy rather than arbiters of wealth such as YouTube and Twitch on which so many (like Ninja) rely for their livelihood. And what’s the result? Jenner has transcended all other social media influencers. She is not just the most popular social media icon, but the most business savvy (by far). One can imagine she is the first of many to come. Kylie Cosmetics launched two years ago with a $29 “lip kit” consisting of a matching set of lipstick and lip liner, and has sold more than $630 million worth of makeup since, including an estimated $330 million in 2017. Even using a conservative multiple, and applying our standard 20% discount, Forbes values her company, which has since added other cosmetics like eye shadow and concealer, at nearly $800 million. Jenner owns 100% of it. To compound her success, contrast Ninja’s schedule with Jenner’s. To maintain the Ninja audience, Tyler and his wife Jess keep a tight schedule of 12+ hour days. They typically spend half an hour together in the morning, then he streams, usually for about six hours while she takes business calls. They take a break around 4 p.m. before he gets back on the stream around 8 p.m. for another six hours. He goes offline one day a week, which they call a “date day,” though recently they’ve been skipping it because he’s been so busy. Which job would you rather have? For Jenner, certainly there is more work involved than just posting photos, but the idea remains the same. Her business will continue to operate even when she is not online. Instagram posts can continue to bolster sales, but there is less of a risk of loosing 20-40% of your customers in a weekend. Yet, like Ninja, Jenner is not immune to the risks of fleeting interest. It seems far-fetched to think the brand, whose customers are mostly women ages 18 to 34, will last that long, much less independently. Especially with a business tied to the fickle world of personal fame. Stars fall out of public favor or lose interest. When you can make such quick cash, who needs a big exit? Kylie Cosmetics has already generated an estimated $230 million in net profit. In either case, both Ninja and Kylie Jenner are doing well for themselves, but it is worth considering the leverage applied to scaling a business. While the next big thing in gaming or fashion may dwarf the current leaders in popularity, maybe future business minds should focus less on “the grind” and more on creating things that last. So I test drove a Model 3, and I have some thoughts. So six years later, the Model 3 is rolling out to the general public with the allure of a $35,000 Tesla. Still all electric with a giant touch screen, plus crazy features like autopilot no one would have imagined to be possible back in 2012. Before the test drive, I had never been in a Tesla on the road let alone driven one. I was purposely avoiding the car knowing I would want one even more after I went for a test drive. But TL;DR, surprisingly that wasn’t the case. I’ve spent so many years thinking about the economics of owning a Tesla while listening to others talk about what the cars are like to drive and own. When I got to actually drive the Model 3, I already had my expectations and mind set on not buying one. I tend to be pretty frugal, and try to be rational about buying things that I really need instead of overspending on cool things that are just for fun (looking at you DJI Mavic…), so I knew going in that the car would be a blast, but an unnecessary purchase for me at this time. Maybe a few years down the road, when my current car starts to show its age and EV costs have been subsidized further by increased production, I’ll finally be ready to get a Tesla. For now, driving a Model 3 was just a fun thing do on one hazy Sunday morning. I immediately realized there would be a steep learning curve to understanding the controls. The first thing I usually do when setting out to drive a new car is adjust the mirrors (as I try to be a good driver), but there is no dial on the driver door panel. It turns out you have to tap the “car” button in the bottom left of the screen to bring up the controls menu, but without the sales associate to point me to the menu, this would have been a complicated task of searching through menu options. I could see myself sitting in the car for 30 minutes to an hour just figuring out what it can do and customizing it all to my liking. A Tesla feels like a gadget and tries to bring the simplicity of a smartphone design to a car. It works to an extent, and definitely would take time to get used to. When I found myself wondering if there was a setting to adjust the rearview mirror, or if I could just reach up and do it manually, I knew I was a bit overwhelmed by all the changes to the controls. Luckily, the controls for seat position adjustment are still on the side of the seat, so some of your muscle memory may still transfer over. It’s just hard to tell when that’s the case. I drove the 3 out of the parking lot, the first thing I noticed was how heavy the car felt and the weight of the steering. The car feels strong, big, and solid. Turning the wheel takes effort, but not an absurd amount, just enough to give you firm sense of control. I wonder now if this is another setting Tesla programs into the car. Could there be a “light” steering mode that reduces the tension in the wheel? I don’t know why they would do such a thing, but it seems possible. Because the controls are reduced to a wheel, two stalks, and a screen, many of the controls act differently than a normal car. The turn signal for example always returns to the center, which is confusing because for all the car’s I’ve ever drive, a turn signal in the center position means its off. Pushing to the up or down position will turn right or left. I learned there is a short and a long press to the turn signal stalk, but I didn’t figure out exactly how it worked. All I know is that as long as you ignore the fact the stalk always returns to the middle position, you can signal for starting and completing turns by pushing up or down the same way you would on any other car. The 3 is even smart enough to recognize when you’ve completed a turn, but in some cases when I put the signal on too early, the car decided to turn the signal off before I even made it to the turn. The Model 3 goes 0 to 40 goes by in a flash and you don’t realize how fast you’re going because it happened so quickly. Just to reiterate, I was trying the Performance upgrade, so the pick up probably won’t be as powerful on lower models, but the immediate feedback and roller coaster feel, should be transferrable. There was a car ahead as I merged onto the highway, so instead rocketing by at the last minute, leaving the car in of in a cloud of dust, I decided to play it safe and drive like a normal person. Hold mode puts keeps the car in place when you push in the break all the way at a stop. Creep had to be programmed in because EVs do not inch forward in the same way a gas engine does while idling. Unlike a cell phone or laptop which has charge limiters for batteries, you have to set the max charge for a Tesla (~90% while city driving, and 100% for long road trips). Avoiding a full charge helps keeps the battery in good condition for longer. The whole point of the test drive is to make a decision about buying the car, right? So what configuration do you want to get? Most of us bought into the allure of a $35,000 Tesla when the Model 3 was announced two years ago, but we still aren’t quite there yet. This is all brilliant marketing by Tesla to lure you in with the $35,000 option, anchoring your first impression of the car to a lower price, while only selling configurations that can cost upwards of double the base price for the next 5 to 8 months (as of late August 2018). So the $35,000 (or $27,500 when considering the $7500 credit) you were expecting to pay immediately goes up by $14,000 for the Long Range model with rear wheel drive. Want Long range and Dual motor? That’s another $5000 or $19,000 over the price of the base model. You could buy one Model 3 or three cars for $54,000, and that doesn’t even include the “cool” Tesla features like Autopilot or Full Self-Driving mode add-ons (for an additional $8000). At the high end, the Performance model can cost up to $80,500. How is that affordable? A formative view for my understanding of the value of the Model 3 came from Mr. Money Mustache. He thinks about buying a Model 3 while considering cost-per-use in relation to the base $35,000 model and upgrade options. If you are trying to decide to buy now or wait, a commenter brings up a valid point: “Getting the larger battery gets you the full $7500 tax credit, getting the smaller battery likely doesn’t.” This is because Tesla’s US federal tax credit will expire at the end of 2018. The lucrative $7500 will only apply to vehicles delivered (not ordered) before December 31, 2018. Afterwards the credit will decrease by half and expire at the end of 2019. Let’s consider how this pricing scheme came to be because it all seems a bit out of proportion. Before we get into Model 3 pricing, first think about what you get by upgrading from public transit to a car (of any kind), then move to what you get for the base line Model 3 and above. Owning a car is a luxury allowing you to move around on your own time and optimize the routes you drive. You don’t have to adhere to bus schedules, try to find rides with people, or spend time going out of your way. A car takes a psychological load off your mind that gives you the freedom to engross yourself in your work without ever worrying about rushing to make a bus that leaves in the next 5 minutes. In many places a car is not a necessity, but it can be a quality of life improvement. On the other hand, not owning a car has its upsides. For one, there is a significant cost savings when factoring paying for a car, insurance, gas, tolls, parking, and maintenance. It’s not unreasonable for owning a car to cost upwards of $10,000 a year (with a rough estimate of $400 a month for loan, $250 for parking and tolls, $150 for insurance, $150 for gas). Plus, you can get a lot done on the bus/train/taxi when you aren’t the one who must be engaged behind the wheel. Ok, so for any car you decide to go with (or not) you’ll have to weigh these pros and cons. Driving a Tesla does not magically change the dynamics of owning a car any more than driving a Subaru does (yet. We’ll have to wait for advancements in autopilot and changes to regulations). If owning a car is a luxury, owning a Tesla is an opulence. Let’s say you’ve decided against the advice of the Millionaire Next Door and are in the market for a new car under $50,000. What would persuade you to upgrade from a $35,000 Model 3 to a more premium package? The Model 3 is a curious case of behavioral economics. It is more common for car brands to price multiple models across a $35,000 to $80,500 price range with visibly distinct prestige of owning a higher end car. Just look at the BMW line-up, they (logically) use a numbering scheme that increases with perceived prestige. For the Model 3, the body looks the same for all price configurations of the car, the only distinguishing factor is the tires (and this little badge on the back). Is it any wonder why the upgraded wheels cost an arm and a leg? It’s how you show you got the nicer car. Tesla is not the only company to do this. Apple is a constant offender, tweaking iPhone design to show make newer models easily recognizable, and adding a big red dot to their latest and greatest watch. This makes business sense. For a company to make the most from its high end customers in order to subsidize lower end products is nothing new either. Apple also does this with the iPhone and Mac in regard to spec upgrades. The build quality, apps, OS, customer support, and general Apple ecosystem are all the same no matter of the type of iPhone or Mac you decide to purchase. The majority of Apple’s margins come from upgrades that cost them a tens of dollars that they sell to you for hundreds (or thousands). There’s nothing inherently wrong with this. It’s how Apple continues growing even with a trillion dollar valuation. when you raise prices and a segment of your customer base will only buy the best, you can achieve higher average selling prices — over $100 higher year-over-year ($796 versus $694) — which means higher revenue. However, making business sense does not absolve companies of the psychological manipulation they employ with these pricing strategies. By singling out the one feature you get for a disproportionately large amount of money over the cost of the base product, companies frame upgrades to make you forget about all you get when you initially decide to opt for their product without the extra bells and whistles. Just look at the similarities across the iPad lineup. If Apple only pointed out the commonalities, people would question upgrading, so Apple makes the differentiators big, bold, and right at the top. Whether you just have money to spend and only settle for the top of line, or have been saving for years only to wait a few months longer, consider the return on investment when spec’ing out a Model 3 (and anything else you buy). Maybe you ski every day and need all wheel drive, or live so far away from charging station that the larger battery is a must, but if that’s not the case for you, is the baseline good enough? After all, you’re still getting a Tesla. So buy now or wait? This totally depends on your budget. For me, I’ve had my current car for three years, and plan to keep it for at least 10. If you need a new car right now, and are looking at a Tesla, maybe this helps to think more rationally about the purchase. A used Chevy Volt is a decent alternative that checks many of the same boxes as a Tesla. And if you’re set on a Tesla, just consider if driving down the highway knowing you’re safe with your hands off the wheel is worth $8,000, It is fun to be an early adopter, but why not let others subsidize your cost a bit? Are you going to buy one of these? There are tons of resources online that will help you go from 0 to 27.2 miles in some amount of time, but I’ve been running and biking for longish distances for a while now. Working up from a 1 mile run wasn’t something I needed. I wanted a plan that would help me go from running most of the way for 10km to running the entire 10km (after swimming a mile and biking for 20). That’s not to say I ignored all advice out there. I read this book and also heard this one was good too. For me the swimming was going to be the hardest leg of the race. Starting out, I had never swam in open water for any significant distance (other than wading around in the ocean). I knew how to swim, but going for a mile seemed impossible. I also have been exercising, weight training and playing sports consistently for several years now. So this is more of a guide detailing how to work training for a triathlon into your usual exercise routine with some tips and tricks for doing the best you can in the race. Weight lifters use this time to “bulk”, eating anything and everything to assist gaining muscle (and fat) in preparation for the spring “cut”. But we’re here for lifelong health, so you don’t have to do anything too extreme. Just keep to your normal diet and adjust your workouts for the weather. When it’s dreary outside it’s mentally tough to go for a run or a bike ride. You can do it, and if you do, it will give you a psychological boost for warm weather. If, you’ve done it in the rain, you can definitely do it in the sun. In recent years, I’ve invested in cold weather and water proof training gear, so I can ignore the weather and exercise outside all year round. Inside, the winter is for weight training and cardio in the pool. Use the opportunity to build or maintain strength and work on your swim technique. I exercise 4 to 6 times a week and keep to a ratio of 3:1 strength to cardio in the winter. My rotation generally progresses through legs/shoulder, chest/triceps, back/biceps, and swimming. I find this to be a good balance in the winter as I’m not a fan of cardio on stationary bikes or treadmills (they just remind me I’d rather be outside). I also include abs most days and like to warm up on the rowing machine (or erg, as I recently learned they are called). I try to keep my workouts from getting too repetitive, but center my training on bench press, squat, deadlift, and shoulder press variations. Swimming is the fun part. I am terrible. Up until I really started focusing on getting better for the triathlon, I could not string together many laps in the pool. I blame my inability to float (although I am now certified for the capability, see week 13), but it’s really that I don’t swim enough to develop into a strong swimmer. That didn’t discourage me from trying. Swimming is tremendous cardio exercise and it’s low impact. Plus it’s humbling watching people many (many) years older than me out stamina me, swimming for what seems like days, while I struggle to do four laps in a row. Every time I jump in the pool, I’m determined to do a little bit better than I did last time. It’s exhausting, both physically and mentally, but rewarding, when I finish swimming faster or longer than I had before. In the summer I flip the weight training to cardio ratio, opting to spend as much time outside as possible. I’ll bike two or three times a week, run once or twice, and go to the gym only once or twice. Swimming isn’t generally part of my summer work our routine, as I hadn’t started open water swimming until this summer, and I despise being in a stuffy indoor pool when it’s nice out (outdoor pools are hard to come by here). With that background in mind, here’s how I’ve adjusted for the triathlon. I signed up for the triathlon three months ahead of the race day. The race is Olympic distance, which in this case, entails a 1 mile swim, 20 mile ride, and 10 kilometer run (the standard Olympic distance has a 40km/25 mile bike ride). I knew from the beginning that swimming was going to be my weakest link, and it would be the hardest leg mentally for me to train. Feel no compulsion to stick to this schedule. I know I will do something completely different for my next race. This is just a way to show how you can do a triathlon at your own pace when starting with a solid background. This week I started to taper my training. I didn’t want to feel depleted for the race, but I still wanted to stay in form. It was odd to limit strength and conditioning training for means of consistency instead of progression. If you’re used to keeping a regimented workout routine, it may feel strange to ease off for a while (it did for me), but the process paid off. I felt strong on race day, with the energy to make it through each leg. Only wear a wetsuit if you really need it for the water temperature. It will save you valuable minutes and seconds if you can run out of the water and jump on your bike. For me it helped with training in the weeks leading to the race as the water warmed up, but on race day, the water was warm enough to swim without a wetsuit. I decided to wear the suit given I mentally prepared to wear it, but for the next race I think I’ll go with just the tri-suit. Energy gels are nasty and leave a weird taste in your mouth. Stick to the energy chews for a quick burst carbohydrates to restore glycogen. And go with an electrolyte water for your bike ride. Sugary sports drinks can weigh you down. Did you get one of those neon buoys for swim training? If you didn’t you should (and go with one that has an insulated pouch for your keys). But they also come in handy for wearing your bib number across the finish line. I’m not sure this is the case for all races, but for mine, it was required to have your number on your bike and helmet, and to wear your bib number `during the running leg. I pinned the number to a shirt that I put on for the run, but others pinned their number to the belt of their swim training buoy. It was an interesting idea I hadn’t considered. Bring a towel to lay down at your transition spot, so you can quickly dry your feet. And only bring the bare essential accessories with you into the transition area. For me that included water, snacks, headphones (for getting in the zone during warmup), extra goggles, and a towel. Of course you also need your bike, helmet, cleats, running shoes, number, swim cap, and goggles. I brought everything in a reusable mesh grocery bag so it could collapse down easily. Rapid-fire miscellaneousness: Get to the race an hour before it starts (and at least an hour before your start time). Bring headphones to keep you focused and calm. Eat a regular breakfast, but not heavy (I had eggs and pb&j). Stay hydrated the day before. Don’t eat dinner tool late the night before; give yourself time to digest. Stay mindful of the start time of the race and using the restroom beforehand. Inflate your bike tires either the night before or at the race (I didn’t bring a pump, but some people did). If you are cheering on a racer, bring a giant poster cut out of their face. Prep your bag the night before, so you can wake up grab the bag and go. Enjoy the race! Once it’s starts, it will be over in an instant. Take count of everything going on and have fun. I’ve always exercised to enjoy the outdoors and strive for lifelong health. People think I’m crazy, but I actually like to go for a run or bike ride. Because of this, it didn’t feel like I did much different outside of my normal routine. Going into it, I had never swam in open water, let alone continuously for a mile. With a little coaching and a lot of practice, I was able to complete the swim, and was congratulated by my screaming fans “YOU FINISHED THE SWIM!” as I ran out of the water. For the next race, I need to work on the running most to yield the most improvement for the effort. The biking was fine, but it took a while for my legs to warm up. Combined with cutting down the transition times I could be in pretty good shape for a 10-15 minute improvement. Always something to keep pushing for. So that’s it! Completing a triathlon takes mental and physical preparation, but with a little determination you can do it without deviating too much from your normal routine. You just have to stick with it! *By lazy person, here I mean person who doesn’t want to stick to a new, strict, and regimented schedule because said person has been exercising for consistently for a few years and already has a good routine going. So more of an “avoiding change” lazy, than a “sit on the couch all day” lazy (although said person enjoys that kind of lazy too). Screen Time is Apple’s take on the growing trend of operating system level features that help you discover how you are really spending your time with your digital devices. These features and metrics provide you the baseline information to understand where your time is going, and give you the power to make changes to your habits. You are in control of how you use your device, and Screen Time, like Android’s Digital Wellbeing, will not inherently force you to act in a certain way. The tools can shape your behavior, but it is not Apple or Google prescribing how you should use your time. You are still the one making the choice to eat your vegetables. 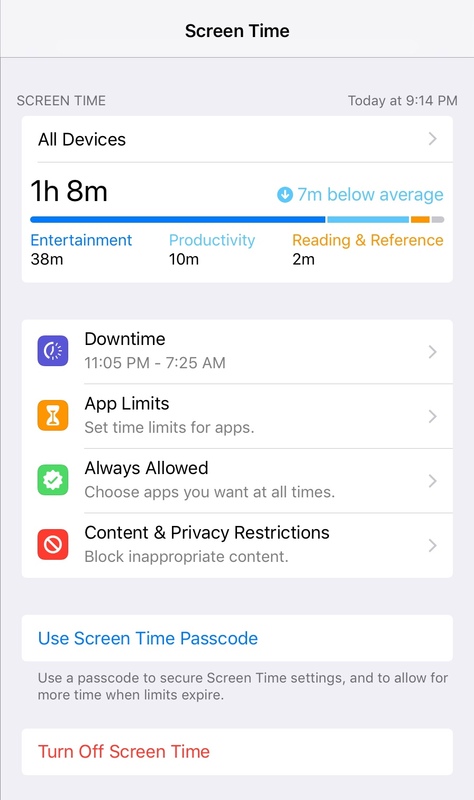 There are four main features (and one minor) under the “Screen Time” setting: Device Screen Time, App Limits, Downtime, Content Restrictions, and Bedtime. Device screen time gives a detailed look at where you spend all your time on your Apple devices. You can see your daily and weekly usage trends, your most used apps, how often you pick up your device, and how many notifications you get. In the last week, I’ve used my iPad for 10 hours and 45 minutes, with over and hour of that time coming during my defined device downtime. You can tell I spent some time organizing my calendar last weekend. The average length of time per device “pickup” isn’t displayed (nor is most common amount of time), but a quick calculation given the weekly time spent and total pickups shows roughly 2 minutes and 45 seconds per interaction with my iPad. I’m wondering how this compares with others, and how many meaningful interaction people have with their devices in a day. Lowering the number of times we glance at the time or check for notifications could increase the average time, but is session length is not necessarily an indicator of time well spent. It’s fun to see all this data, but there are no recommendations of how to use your device more intentionally. Apple lets you do all the analysis and any subsequent action you decide to take is entirely your decision. 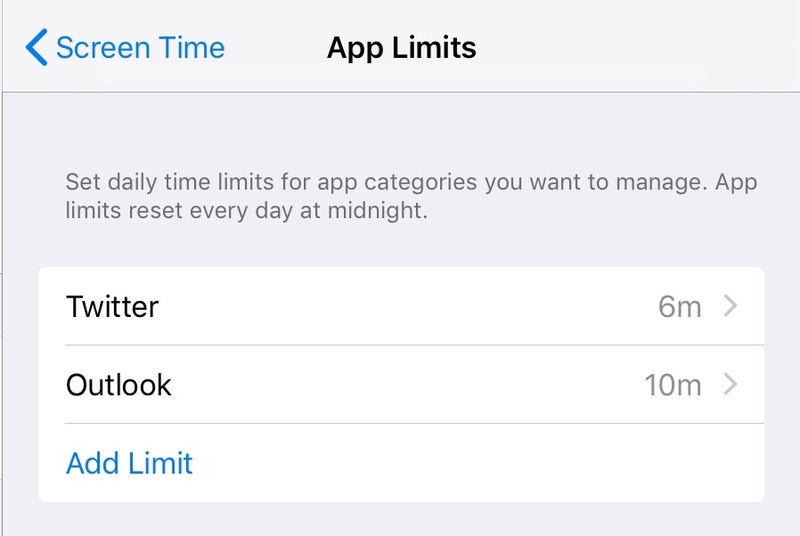 Once you’ve decided you need to take action, App Limits let you reign in your usage of certain apps. 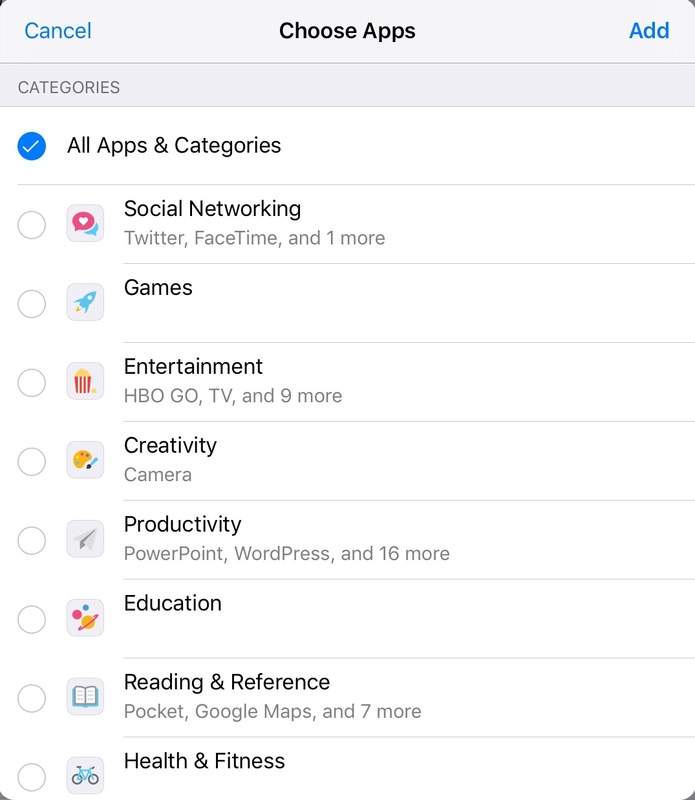 You can set limits for individual apps or categories of apps. Apps will act the same way whether or not you have screen time limits enabled. While you have time remaining, you can keep using the app, but once time runs out, that’s it. No more for today. You can always go through the block, but Apple tallies up all the times you were bad. 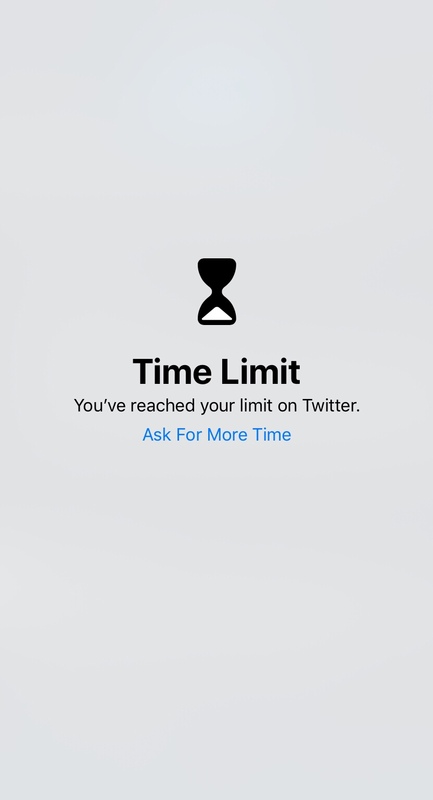 Interestingly, because my time on Twitter and Outlook is a scarce resource, I now find myself using the entire time limit every day. Previously, I would only go on Twitter once or twice a week, but when I did, I found myself engrossed in the content for a while. I figured Twitter would be a prime candidate for trying the new app limits. I wasn’t wrong, but now, since I know I’ll only be there for at most five minutes, I find myself spending time on Twitter every day. Downtime is the more interesting feature. 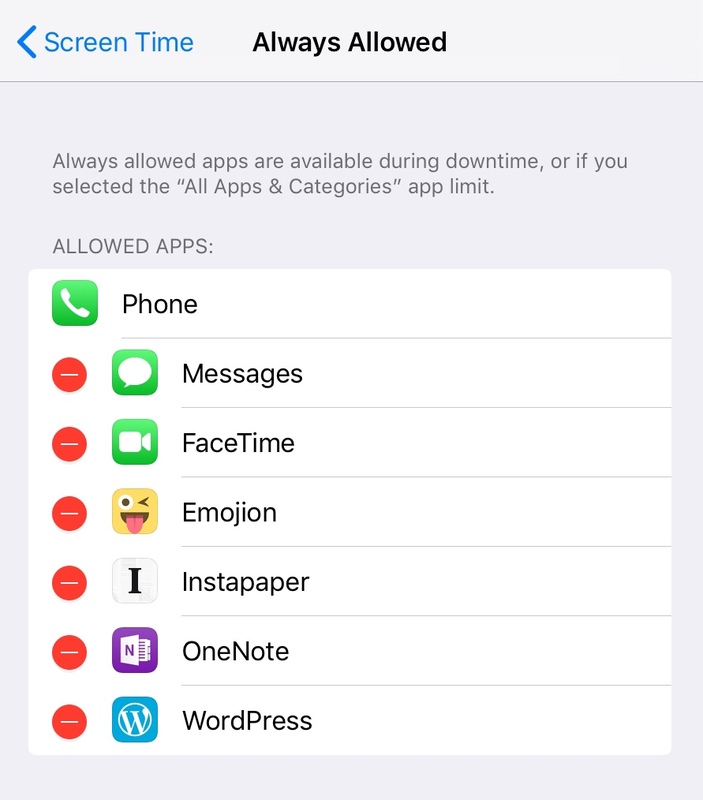 While screen time limits are opt in for certain apps you think you use too much, Downtime is default opt out for every app on your device. Enable Downtime and you will be locked out of all your apps from the start to end time. You can individually toggle on apps you want to use an app during downtime. 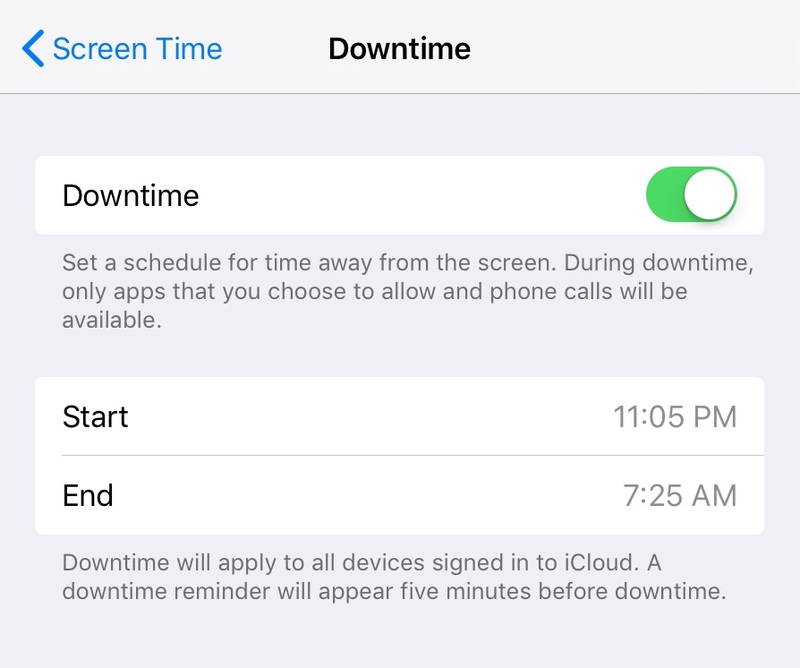 This is a two part set up, first by enabling the Downtime setting, then returning to the Screen Time menu and selecting Always Allowed apps to select the apps available during Downtime. This feature triggered the most significant, and positive, behavioral shift for me. I start Downtime a little while before I generally go to sleep, and end it a little after I generally wake up. I only enable apps where I most intentionally create and consume content. For me, this means I can read the articles I set aside for myself earlier in the day, and can write what’s on my mind. That’s it. 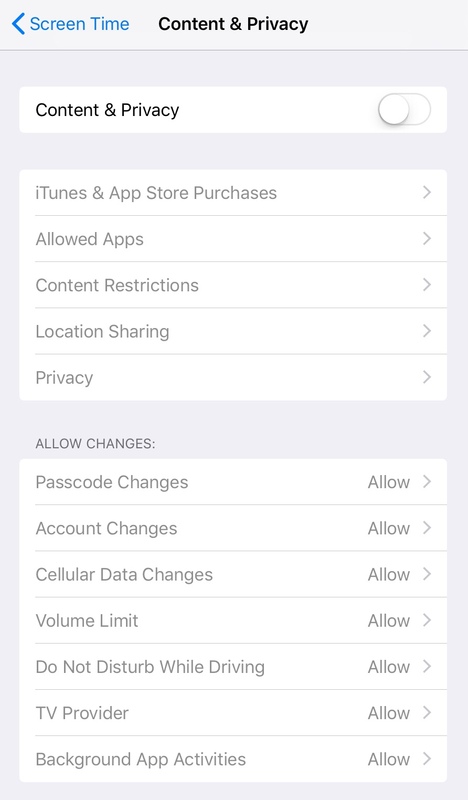 (Phone, Messages, and FaceTime are also enabled by default). Since I installed the iOS 12 beta on my iPad, I’ve stopped watching YouTube hours on end before going to sleep, and I’ve stopped immediately checking notifications right after waking up. These are also under the Screen Time setting, but it feels like they were just moved here because they make sense in relation to the other settings . Nothing too interesting, but you can set a Screen Time passcode for your self if you really want to lock your self out of some apps. You should really create your own Bedtime mode using Downtime as I described above. 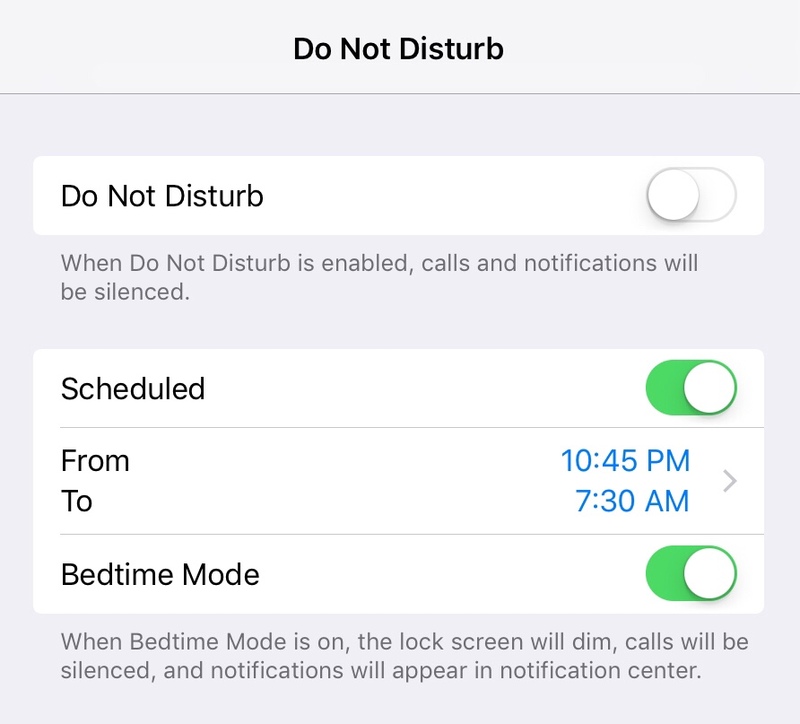 The new Bedtime mode toggle under the Do Not Disturb Setting will dim the lock screen, silence calls, and send all notifications to notification center. It’s really only an extension on the existing Do Not Disturb mode. Nice to have, but not a major improvement compared to the other Screen Time features. Apple’s Screen Time features are available now in the iOS 12 public beta but you may just want to wait for the general release this fall before trying everything out (it’s telling I accidentally typed “bug” while trying to write “public” just then). Betas allow developers to fix issues in software before the official release, and running beta software can cause some headache when your main device does not work as expected. I spent the entire weekend trying to sort out why changing my WordPress theme brought down my site. There was this error and I just couldn’t figure out what was happening. I exported my data, moved to a temporary free WordPress.com account as a backup, and re-installed WordPress on my self hosted site. Before we get to far into it, to clarify, WordPress is a technology that lets you create blogs. You can either run WordPress on your own server (in the cloud) or let a company manage your installation. WordPress.com is a company that manages WordPress installations, so you can blog away and let WordPress.com handle the technical details of running the site. Getting back to it, I reinstalled three more times because each time I ran into a different problem. I think the issue came down to a database incompatibility, but it was just one in a series of problems I’ve encountered over the last few years while running my own site. My site was “defaced” via an exploit in an out of date version of WordPress, was unable to connect to Jetpack services, and needed to be re-installed one too many times. This iteration was the last straw. I needed to switch from site maintenance mode and get back to blogging. There’s a lot you need to keep up with when running your own WordPress install. I enjoyed learning all the details over the years of running my site. Finding the pieces and putting them all together was fun and made for fulfilling work when the site decided to play along. Although, when something went wrong, managing this workflow and disjoint accounts brought my progress writing posts to a complete halt. Site backups are crucial in case anything every goes wrong (which through my experience seems common), but they are costly, unintuitive, and require manual configuration. WordPress must be kept up to date, with a self-hosted site, you need check for updates. It requires active engagement. I try to write posts on a weekly cadence, but sometimes there would be long stretches of time I didn’t go on the site. You can configure auto-updates to the WordPress core, but there are many caveats. In either case, it’s another task you need to keep in the back of your mind, using up resources I could allocate elsewhere. In then end, all this mental overhead was cutting into my time and creativity. Running the technology distracted from what I wanted to do with my site. And with that, I handed over the keys to WordPress.com. Note, this is not a review of WordPress.com. I’ve only used the service a couple days, so I’m still deciding if it’s the right fit. However, I had five accounts to manage everything related to my website, and now I have one. WordPress.com sits in the middle of the blogging platform spectrum of user control and one experience fits all. I can still modify my the site to make it feel like my own, but I don’t have the same level of configuration as a self-hosted site. It’s a good first step to building a focus on writing, because I don’t want bells and whistles anymore. I want to write and develop something new. Technology works best when it’s invisible. I am optimistic that getting the site administration work out of the way will free up headspace to think and give me time to create more. My site has a history on WordPress, so there is some lock in to the technology. As I searched for a platform that just lets me write, switching to WordPress.com was an easy first option to explore. Since it’s easy to transfer WordPress data from one hosting service to the next, I brought all my posts with me to WordPress.com. With that said, I am going to keep iterating, with new formats, platforms, and mediums. I am now a customer of WordPress.com. If I decide their services improve my ability to create, I will stick with them. Otherwise, as WordPress.com says in their own words “You own your data – take it anywhere”. Medium.com leans further towards the one experience fits all side of the blogging platform spectrum. On Medium, you get a title, and a story. That’s it, but it’s amazing. The focus is on the content of the words on the page, not the theme of the website. I have a Medium account with zero posts (until know). Starting today I will be cross posting longer form thoughts like this under the Medium Partner Program (and I checked, this is allowed by the Medium Content Guidelines). All my posts will still be on my site, but I want to experiment with Medium to learn how the different communities interact. So let’s see how this goes. The content of my blog has changed over the years from small ideas (Seth Godin-style), to connecting things I read/hear/watch, weekly reviews, back to connections, and now a news feed. I can already tell this latest iteration is working well. It’s easier to get back to writing and integration with email updates, social media, and reader feedback is better overall. There’s less in the way of getting things done, and I’m hopeful this new format will keep my momentum going strong. Be on the lookout for a future post explaining “Why I’m Staying with WordPress.com” or perhaps “Why I Switched to Medium”.